Only several real estate related websites show up and it may well be your competitor taking your leads way from you by simply having their website optimized correctly. Nowadays it’s crucial to have online presence in search engines especially if you are a local Waltham, MA business serving your local clients whether they are prospective sellers, tenants or buyers. 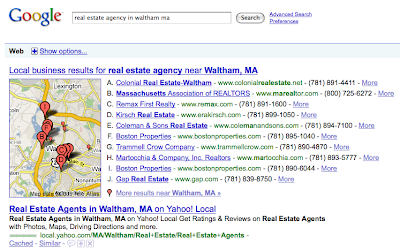 Optimizing your Waltham real estate website will defiantly increase lead generation. The SEO process for a local business owner is pretty straight forward but following the best practices and making sure everything on your website is done correctly is vital. I have optimized local and statewide real estate agency websites throughout Massachusetts. Doing SEO for a local real estate business has helped me gain a better understanding of the importance of lead generation from a real estate agent point of view. Whatever the case may be a lead is a lead and online marketing gives you that option to use your website as a marketing tool to reach your locals and turn them into qualified buyers, sellers or tenants.